On 26.09.2011, the Ghana Football Association published the squads for the GLO Premier League 2011-2012. Hearts of Oak SC is traditionally one of the biggest clubs in Ghana, having won 19 league championships. However, before the GLO Premier League 2011-2012, fans and experts have been criticizing the club for its lack of ambitions at the transfer market. Hearts of Oak SC has registered a lot of new players but the big names are missing. * Hearts of Oak SC has signed a lot of players from clubs who performed at second level in 2010-2011, including midfielder Thomas Arnold Abbey from Windy Professionals, Ernest Ackon from Metro Stars FC, Yusif Alhassan from Mine Stars FC, attacker Gabriel Armah from Deportivo FC, defender Abdul Ganiyu from the Red Bull Academy, John Krassey from Metro Stars FC, lanky midfielder Umar Tawfik from Guan United FC and central defender Mohammed Tuariq from Guan United FC. Ganiyu, who turns 19 in a week, is an interesting player who captained the well-run Red Bull Academy. Tawfik, who is registered as a player above the age 23, has also been performing well during the pre-season. Last season, Hearts of Oak SC hit the jackpot when they signed the creative Uriah Asante from the lower leagues and they are hoping for the same effect with the eight players mentioned above. Uriah Asante is a hard-running, skillful and lively winger, also comfortable as an attacking midfielder or striker. * Hearts of Oak SC has also made some rather strange signings from my point of view. 22 year old Dominic Edoo Bukudah failed to break through at Eleven Wise FC while 26 year old journeyman striker Raymond Darkeh has never scored regularly at his former clubs, including New Edubiase United FC, King Faisal Babes FC and Tema Youth FC. * On the positive note, the new players Kofi Agyare, Prince Attakora Gyimah, Isaac Ofori, Joseph Tagoe and Ahmed Soulama are all interesting. Towering central defender Kofi Agyare, who joins from Berekum Arsenal FC, looks very strong. Left-winger / striker Prince Attakora Gyimah was impressive for BA Stars FC during the second part of last season and expectations are high at Hearts. A couple of years ago, Isaac Ofori, was described as one of the star players at Wa All Stars FC. Ofori was rather quiet during the GLO Premier League 2010-2011, though lively enough for Hearts of Oak SC to snap him after the season. Ofori was part of both the Ghana U-20 and the Ghana U-17 national football team in 2009, and I believe he is still a teenager. Ofori is primarily a winger. Petit midfielder Joseph Tagoe, fondly called Bobby Short, played for Sharks FC in the Nigeria Premier League during 2007-2008 and 2008-2009. Due to contractual problems, Tagoe has not played a competitive match for more than two years. Tagoe, who has to be one of the most skillful players in the league, was a trialist at Norwegian top club Rosenborg BK in early 2011. Soulama, a left-back from Burkina Faso, was presented in this post: https://westafricanfootball.com/2011/09/25/ahmed-soulama/. * I believe that new signing Yussif Faisal is the central defender Yussif Faisal who played for Mighty Jets FC last season. * Despite the lack of big-name signings, there are several quality players left at the club. When motivated, Sammy Adjei is arguably the best goalkeeper in the GLO Premier League. Kofi Agyare and Godwin Osei Bonsu will lead the central defence, unless coming man Saeed Mohammed splits the pair. New signing Ahmed Soulama should claim the left-back spot while my personal favorite Akwasi Bobie Ansah is the brilliant right-back of the Phobians. Experienced captain Esme Mends and the young, promising Abubakar Moro are balancing the midfield. Moro became better and better last season and I expect him to break through any time soon. The attacking quartet of Uriah Asante, Prince Attakora Gyimah, Douglas Nkrumah and centre forward Mahatma Osumanu Otoo, have the goal scoring responsibility. I expect that Otoo scores double figures this season and the in-form striker could very well become top scorer. 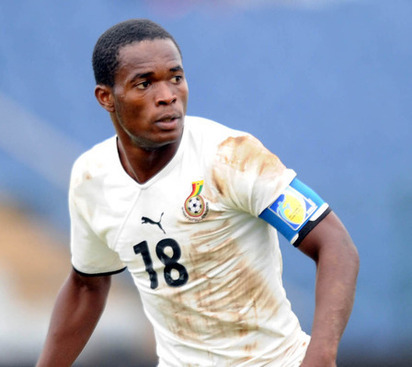 Otoo, still a teenager, has been captaining the Ghana U-20 national football team and starred for the Ghana U-23 national football team during the 2011 All-Africa Games, scoring four goals. Otoo is arguably the best teenage striker in the GLO Premier League. The picture is of Otoo and is taken from kickoff.com. * Hearts of Oak SC will obviously miss central defender Karim Alhassan who joined Egyptian top club Zamalek this summer. Attacking midfielder Obed Ansah has not been registered by Hearts this season and his whereabouts are unknown. Paul Addo, Alhassan Ali, Clement Nii Ashitey, Rashid Iddrisu, Emmanuel Laryea, Theophilus Mensah, Haderu Ollenu, Karim Suleman, Nicholas Takyi, Bright Tawiah, Commey Charles Tetteh, Ahmed Yusif.